I love these roasted vegetables. The recipe is a delicious combination of tastes and oh so healthy. 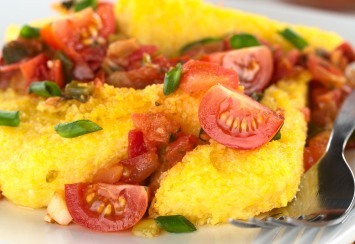 Serving it over polenta, which is the Italian word for cooked cornmeal, is a wonderful idea. Don’t you get tired of potatoes, rice or pasta all the time? I certainly do. This polenta is a bit zippy. 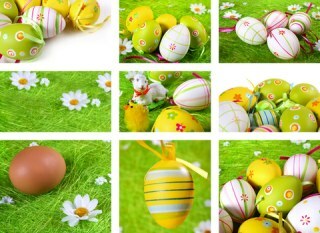 I think you will like it. If you like this one, or tried it and changed it up a bit, don’t forget to share your comments and ideas in the comment section below the recipe. And of course, if you would pin it to Pinterest, Like it on Facebook, Tweet, G+ it etc, I’d be grateful. For the polenta, coat a square 8 inch glass baking dish with gluten-free nonstick cooking spray. In a large saucepan, combine 2 cups of water plus the broth, mustard and cayenne. Bring to a boil. Reduce the heat to medium. Whisk in the cornmeal. Reduce the heat to medium-low. Cover and cook for 5 minutes or until thickened, stirring occasionally. Remove from the heat and pour into the baking dish. Set aside to firm. To make the ragout, cut off and discard the dark green top of the leek. Cut the leek into 1 inch slices. In a large bowl, combine the leek, cauliflower, carrots, mushrooms and garlic. Drizzle the vegetables with oil and toss it all to coat them. Spread the vegetables in a large roasting pan. Place the pan in the preheated oven and roast for 8 minutes. Remove the pan from the oven and stir in the corn and tomatoes. Return the pan to the oven. Roast for 20-25 minutes or until the vegetables are tender. Remove from the oven and transfer the vegetables and juices to a large Dutch oven. Place the Dutch oven over medium heat. Cook the vegetables for 5-10 minutes or until thickened. Stir in the basil, marjoram and thyme. Cover and keep warm. Preheat the broiler with the top rack 4-6 inches from the heat source. Line a baking sheet with foil. Coat the foil with gluten-free, nonstick cooking spray. Cut the polenta into 12 squares and place them on the baking sheet. Broil for 5-8 minutes or until lightly browned. To serve, place 2 polenta squares on each of 6 plates and top with the ragout. Serve warm. If you like you can garnish the meal with cherry tomatoes cut in half and sliced green onions as in the image. This recipe is gluten free as long as you make sure you have a gluten-free mustard. It’s also a great vegetarian meal. Don’t want vegetarian? It’s great served it along with grilled chicken or beef. If you need diabetic recipes, this one is okay if you can handle the carbs in the polenta. If not, serve these wonderful roasted vegetables with meatballs or grilled meat and a big salad. Perfect. To find more vegetarian main course recipes, like these delicious roasted vegetables, browse here.